This is sort of an update or branch off of a blog post by Gary Keong titled: Azure Automation: Integrating Runbook Source Control using Visual Studio Online (July 2014) and includes some of my learnings. We are going to sync some runbooks for the purposes of subscription management. This could include things like setting up alerts, applying permissions, and applying policies to the subscription. I’m going to assume you have a Visual Studio Team Services Account (create one if not). In this example, I will use two Azure Automation Accounts. The first one will hold the “Sync Runbook.” It simply syncs my Visual Studio Team Services (VSTS) Git repository to my second Automation Account. We’ll call this the Sync Automation Account. The second one will hold the runbooks that manage the subscription. We’ll call this the Manager Automation Account. The two Automation Accounts could be in separate subscriptions. For example, the first one may be in an IT-owned “management” subscription, while the other may be in the subscription it is managing. The runbook to perform this sync provided in the original article (by Gary Keong) could be considered outdated. I found an updated version on Joe Brockhaus’ GitHub called AzureAutomationVsoGitSync. I needed to make some tweaks because Joe’s module uses a username and password for the Manager Automation Account. My company enforces multi-factor authentication for all users, so that’s not an option. Instead, we’re going to use a Service Principal. As explained above, we’re using two different automation accounts. If you don’t have them created, create them now. 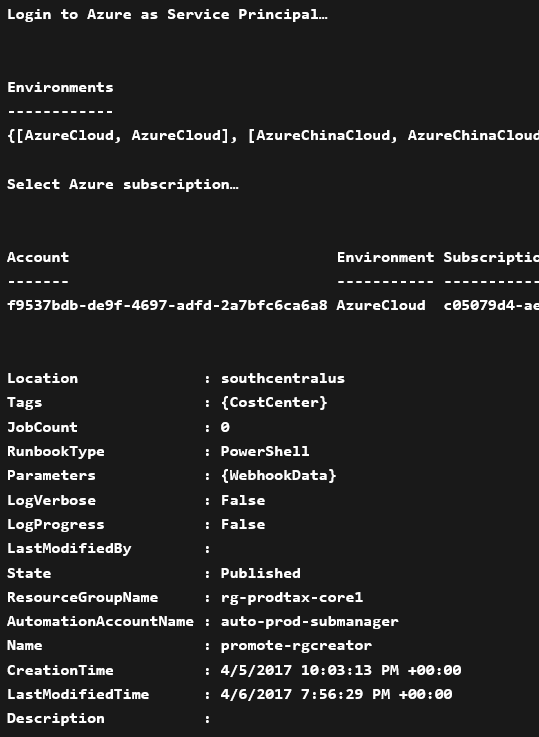 The Manager Automation Account is going to be populated (with runbooks) for us and should be created with the “AzureRunAs” account. Once created we do need to add some assets. 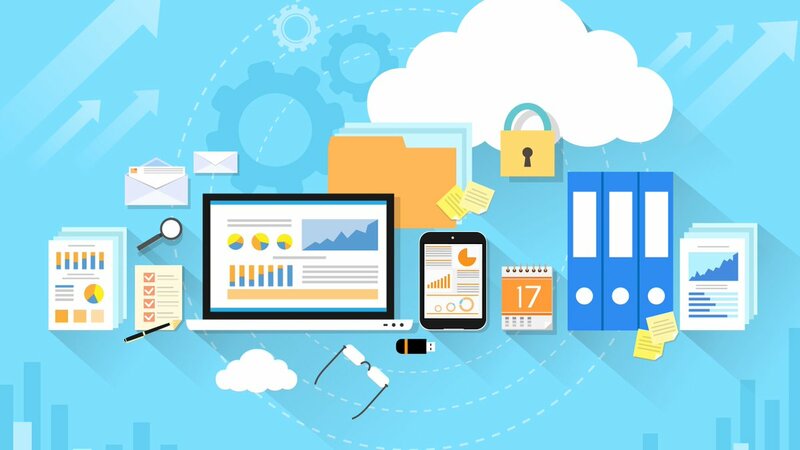 Defines several Azure Automation (variable) Assets and a Certificate asset that will be used to connect to Azure later. Note, the variable names and the certificate name is hard-coded in the script to use the same names as the sync module expects. You need to define the parameters in the beginning of the file and then run each region by itself (sorry for the poor design). Next, we will setup the Sync Automation Account. If you don’t have this created, create it now. We do not need an AzureRunAs account for this one. Download the modified AzureAutomationVsoGitSync module from my GitHub and add it to the Automation Account using the Modules blade. Azure Automation expects the .zip format. Click on the runbook, select Edit, and then Publish. Let’s prepare to use the Sync runbook. 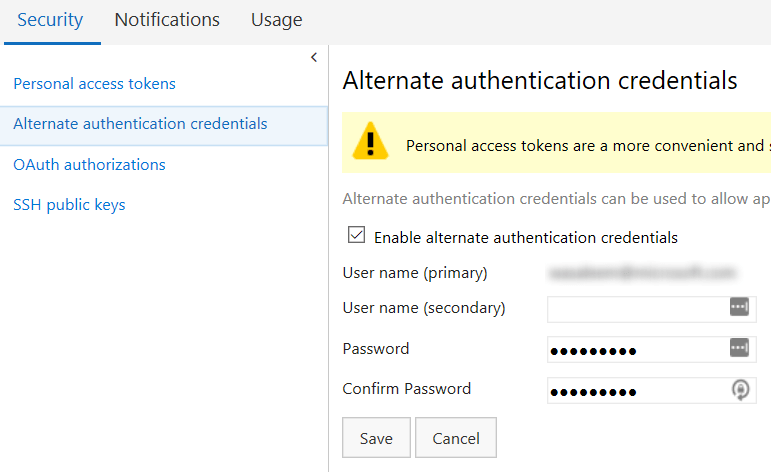 First, we need to set up alternate authentication credentials in Visual Studio Team Services (VSTS). Tip: click on the images below to enlarge them. 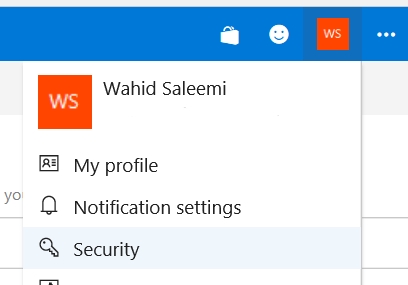 Login to your VSTS account. Click on your name (or profile icon) on the top right and click on Security. Select “Alternate authentication credentials” from the menu on the left. Keep the username and password handy (note them down), as we’ll be using these later. Scroll down to Web Hooks and press Next. For this post, we are going to trigger on code push to the master branch. We need a way to tell the Sync Automation Account, specifically the Sync-AzureRmRunbooks runbook to start. We’ll use a Webhook to do that. Now that we’ve set up alternate authentication, we need to add that to our runbook so it can authenticate with VSTS. Navigate to the Sync Automation Account and click on the Credentials blade. Click “Add a credential” and fill-in the form with your VSTS alternate authentication. Now, ensure the Sync-AzureRmRunbooks is selected. Keep the other defaults and copy the URL. WARNING: You can’t find this URL again, so copy it safely somewhere now, we’re going to use it in a minute. Fill in the values using the table in the previous section. 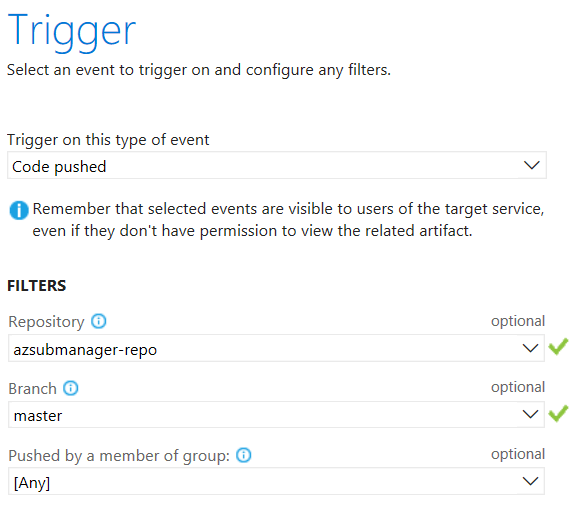 Create a Service Hook by browsing to your VSTS Project’s Settings page. Click Service Hooks. Scroll down and select Web Hooks. Click Next. We are going to use a “Code pushed” trigger. On the next screen, paste in the URL from step #4 in the previous section. Leave everything else as default and press Test. Hopefully the test succeeds, press Finish. If the test failed, re-check your webhook or re-create it. The final validation is ensuring the process works end to end. To perform this test, add a runbook to your VSTS repository, commit it and push the changes. When it completes (without error), you’ll now see this runbook in your Manager Automation Account. Note, runbooks that were deleted from your repository don’t get deleted but we could extend this scenario to do that also. 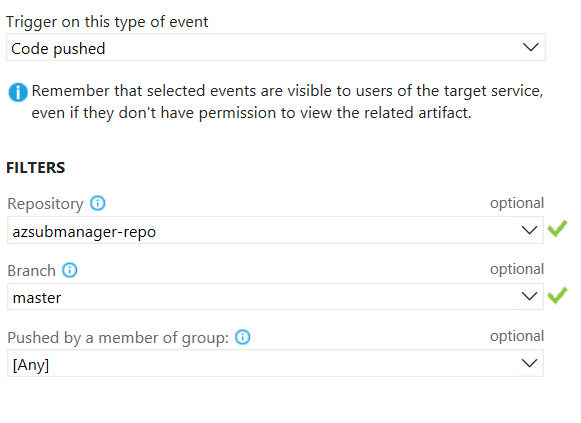 Runbooks Sync-AzureRmRunbooks None, until synced. Modules AzureAutomationVsoGitSync None, just default. Credentials VSTS Alt. Authentication None.